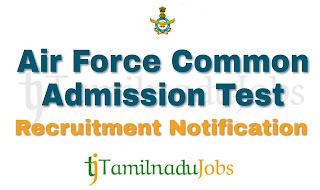 AFCAT Recruitment 2019: Good news for the Aspirants looking for Central Government jobs, now Air Force Common Admission Test(AFCAT) published an official notification for 163 post to fill the Flying and Ground Duty, work in anywhere in India. Candidates must go through the official AFCAT recruitment notification thoroughly before apply for Flying and Ground Duty post. AFCAT Flying and Ground Duty job application is collected through Online mode only. The applicant meets the eligibility norms of AFCAT only apply for the Flying and Ground Duty, else ignore. Aspirants have a golden opportunity in the AFCAT. Applications are invited to the Flying and Ground Duty in Air Force Common Admission Test(AFCAT). Aspirants can apply only by Online, application forms is available online from 01-12-2018 to 30-12-2018 to the AFCAT latest job notification 2019. The Aspirants are requested to read some basic information about the AFCAT job notification 2019 like eligibility criteria, age limit, selection process and more given below. Before applying, candidates are requested to read the official notification of AFCAT Recruitment 2019 for more detail and correct information on their official website(https://afcat.cdac.in/AFCAT/index.html). 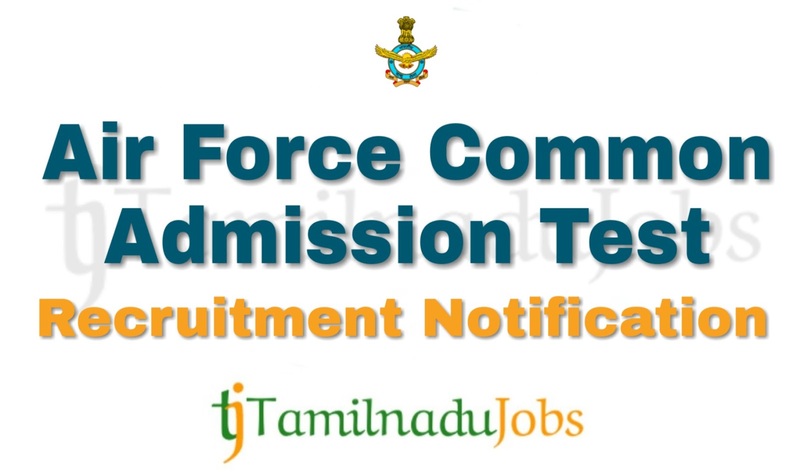 In the recent Recruitment Notification, the following vacancy details given by the Air Force Common Admission Test(AFCAT) and aspirants should go through the vacancy details and eligibility details for more detail in AFCAT notification link given below before applying. Vacancy details of AFCAT is given below. Here we give only the education and age limit criteria for the AFCAT Recruitment notification 2019. For more detail Flying and Ground Duty eligibility details like physical fitness and more, read official notification. Before apply for Flying and Ground Duty job, candidates must go through the eligibility details in official notification of AFCAT Flying and Ground Duty. Aspirants meet the education qualification of Air Force Common Admission Test(AFCAT) only apply for the Flying and Ground Duty job. AFCAT notification 2019, education qualification are given below. Flying: Must have Minimum of 60% marks each in Maths & Physics at 10+2 level and Graduates (Three Year Course) in any discipline from a recognised University who have attained minimum 60% marks or equivalent OR BE/B Tech (Four Year Course) from a recognised university with minimum 60% marks or equivalent. Ground Duty (Technical): must have a Engineering degree or while in your final year/semester of Engineering, Must have scored a minimum of 60% marks or equivalent in any one of the listed disciplines Refer the notification of AFCAT more detail. Ground Duty (Non Technical) Accounts: must have a B.Com degree (minimum three year degree course) from a recognised university with a minimum 60% marks or equivalent. For all the post mentioned above, Final Year/semester students are also eligible to apply, provided they do not have any present backlogs at the time of Test and produce Degree certificate issued by the University as per the date stipulated in the advertisement. Aspirants who want to apply for AFCAT Flying and Ground Duty 2019, must attain the following age limits given by Air Force Common Admission Test(AFCAT). Given Age attained aspirants can apply for the AFCAT Flying and Ground Duty job. Aspirant apply for Flying, minimum age limit is 20 years and maximum age limit 24 years as on 01-01-2020, Upper age limit for aspirant holding valid and current Commercial Pilot License issued by DGCA (India) is relax able up to 26 years, Apply for Ground Duty minimum age limit is 20 years and maximum age limit is 26 years as on 01-01-2020 to apply for the AFCAT Flying and Ground Duty 2019. The application fees for Air Force Common Admission Test(AFCAT) Flying and Ground Duty 2019 differ according to various categories. Aspirants will have to pay the application fees for AFCAT Flying and Ground Duty via Online modes only. The application fees details for AFCAT Flying and Ground Duty given below. Aspirants have to pass the following selection process given by Air Force Common Admission Test(AFCAT) to get Flying and Ground Duty job. For more detail and correct information check in the official website of AFCAT. How to Apply AFCAT Flying and Ground Duty 2019? Step 3: Fill the details required by AFCAT in the form. Step 5: Before submitting the application for Flying and Ground Duty, check the details are correct, then press submit and pay the application fee. Air Force Common Admission Test(AFCAT) is announced the recruitment for the Flying and Ground Duty to full fill their 163 posts. Aspirants can check the salary details for the Flying and Ground Duty in AFCAT.